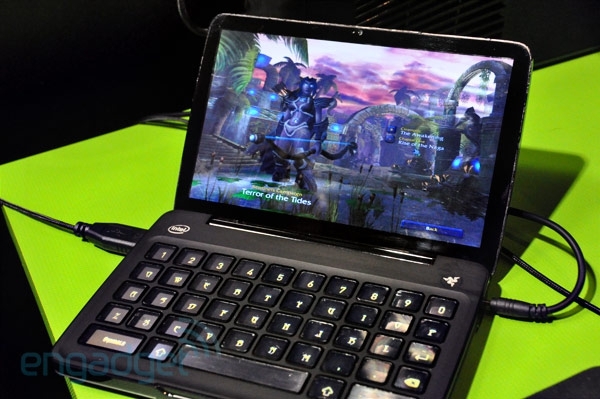 "For all intents and purposes, this is a miniature netbook. But unlike the UMPCs and MIDs that never really caught traction years back, this one has a very specific purpose: gaming on the go. And it's well equipped to handle it. A full-on copy of Windows 7 is loaded on, and Razer's happy to let users surf around on the standard desktop if they so choose. If not, Razer's created an in-house overlay that makes access to the internet, media, games, etc. a cinch. Quite frankly, it's one of the most stunning overlays we've seen -- it's lightweight, non-intrusive, and it actually makes using a machine of this size more practical. The 7-inch capacitive touchscreen was decidedly glossy (and thus, a fingerprint magnet), but the 1024 x 600 screen resolution looked downright luscious." This is "old" news because it happened earlier this month at CES, but I completely missed it in the mad rush of news that happens every CES...and I think it's worth sharing! We've seen a lot of small devices, but I've never seen anything quite like this. The keyboard is actually a series of tiny LCD displays that dynamically re-configure based on whatever game the user is playing. This is the first time I've aware of this technology being implemented in a portable laptop-like device. There's some seriously cool technology at play here!